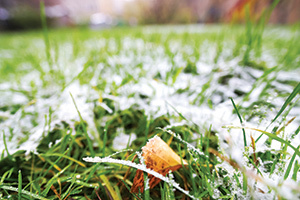 With the proper contract models, low snow seasons do not have to devastate snow management companies. For many people, this winter wasn’t that bad. In fact, the U.S. experienced its warmest winter in recorded history, according to the National Oceanic & Atmospheric Administration. But for those in snow management, it was less than ideal. One LM Facebook follower, who did not return a request for additional comment, vented that he would sell off his snow equipment after the slow season. According to those who have found success in the snow game, slow winters don’t need to be devastating. In fact, with a proper mix of contracts, slow winters can be routine and profitable. Phill Sexton owns and operates snow contracting firm W.I.T. Cos. in Albany, N.Y. This season, Albany experienced its lowest recorded snowfall in history. Typically, the city gets about 60 inches. This year, some areas had 10 inches or less—including a late season dusting. “The most significant snowstorm we had all season was in April,” he says. If he’s learned anything from being in the business for decades, it’s that profit should not rely on snowfall. Sexton, who is also director of education and public outreach for the Snow & Ice Management Association, says contracts should be set up to guarantee a snow company comes out on top. The first step to getting through a slow winter is selling enough guaranteed seasonal contracts, before the season, to cover overhead for the entire winter. Paul Opdyke is the CEO of Serene Surroundings in Plymouth, Mich. The $5.5 million company, which performs 30 percent snow management work to a 90 percent commercial client base, also experienced a below average snow season. Like Sexton, Opdyke’s contract style prevents low snow seasons from devastating the company. His company mixes per-season contracts and per-push contracts. He strives to maintain a delicate balance between the two contract styles. If Opdyke expects a 60 percent gross margin for the upcoming year, for example, he makes sure 60 percent of the upcoming season’s work is coming from seasonal contracts. Seasonal contracts guarantee revenue, and that ensures the company’s overhead is covered for the season. On the other side of the scale, per-push or per-event contracts cover the company’s field labor and material cost expenses. If you’re not covering overhead through guaranteed contracts, a low snow season can force a company to cut labor or lose money. Though Opdyke says it shouldn’t happen, companies that find themselves in hot water can seek relieft from vendors and financing companies. Whether it’s putting off payments or extending terms, Opdyke has found that most vendors are more than willing to cut a deal to help customers out, but don’t wait until the end of the season to let creditors know there’s a problem. He stresses keeping in constant communication throughout the winter and being honest. Building this type of relationship takes work, he says, and it’s important to assign someone that responsibility. At Serene, the company controller is in charge of fostering that relationship and making sure the vendors understand what’s going on. Once you make sure overhead is covered, using certain contract formats can help make sure your company stays in the black. Sexton’s company uses a ceiling/floor model. Basically, it means he and his clients go into the season with an agreed upon maximum number of plows and an agreed upon minimum. If the ceiling is reached, the client pays for additional work performed. If the number of plows falls below the floor, however, the contractor owes the client. Typically, the floor is 25 percent below the standard number of plows and the ceiling is 25 percent above the standard number of plows. This season was the first time Sexton had to exercise the floor. But he didn’t just cut a check. The contract gives customers a credit for the following season. The money comes from untapped labor and material costs after he covers his overhead. Some companies allow clients to use the credit on summer enhancements or maintenance work. In Sexton’s contracts, the credit goes towards next year’s snow work. This tactic helps the company retain snow customers. If the customer does not renew the contract, he or she does not receive the credit. “As long as you’re willing to protect me for a heavy season, I’ll protect you for a light season,” he tells clients. Ultimately, it’s important that customers understand what they’re paying for. Sexton explains to clients that they’re paying for a level of preparedness, not services performed. “I’m selling (clients) an insurance policy that says if it snows we’ll be ready at a certain capacity,” he says. For example, Sexton sees Albany as a 60-inch market, which means he’ll plow about 30 times. So his base price might cover a client for 30 plows. The ceiling is decided by how many times above that number the client wants him to be ready to plow. So a client might negotiate his or her ceiling to cover 35 plows. By paying for a higher ceiling up front, he or she will pay less for those five extra plows than if they breached the standard ceiling. It goes the opposite way, too. The client can sign up for 25 plows in a season and pay a lower sum up front. But if Sexton has to plow 35 times, the client will pay more for those additional plows. Because he says inches can be misleading, he bases his contracts on number of occurrences. Depending on the level of expectation from the client, inches do not necessarily determine the amount of work that will be performed.